A fascinating tour to the sacred city of the Mayan culture! This is an exclusive guided tour to the archaeological site of Chichen Itza and the colonial city of Valladolid. Board our deluxe bus, featuring reclining seats, video screens, 2 restrooms, a fridge and air-conditioning, and ride in comfort into the central Yucatan while you enjoy a light breakfast on board. The first stop on our tour is Chichen Itza, an incredible monument to centuries past. It is a UNESCO World Heritage Site and was recently voted as one of the new Wonders of the World. Well take a guided tour of the ruins site and learn about the fascinating world of the Mayas. At Valladolid you will enjoy a gourmet all-inclusive lunch at a Mayan restaurant, an exquisite variety of Yucatan specialties, as well as the best Mexican and international cuisine. Well finish off the tour with a visit to the beautiful Zaci cenote. Then the bar is open on board the bus (beer, soft drinks and water) for a comfortable ride back to Cancun. 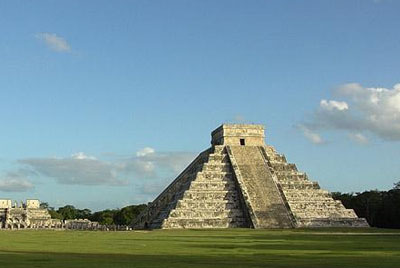 El Castillo or Kukulcan Pyramid, Great Ball Court, Temple of the Warriors, Sacred Cenote, Observatory, The Nunnery and the group of Thousand Columns. Main Plaza, San Gervasio Cathedral and mayan cenote Zaci. Roundtrip transportation in a deluxe bus with air conditioning (includes pick-up service from your hotel). Light gourmet breakfast (baguette, sweet bun and dessert) during the trip on bus. Guided tour at Chichen Itza with certified bilingual guide. Visit to the city of Valladolid where you can take a walk to the Calzada de los Frailes street, visit San Gervasio Cathedral and downtown. All Inclusive lunch in Valladolid with an exquisite selection of Yucatecan cuisine, Mexican and international buffets. Visit to the Mayan cenote Zaci (the visit will be brief after lunch so swimming is not recommended). Unlimited drinks on bus (soft drinks, juices, coffee, bottled water and beer) and refreshing facial towels during tour. Children between 5 and 11 years old get 50% off adult ticket price. Children under 5 years old enter free. Important information: Children under 5 years old can not occupy a seat in the bus. The bus features restrooms and a compartment under bus to keep belongings safe. At Valladolid you will find ATM and telephone booths, as well as restrooms at La Casona and at the mayan cenote Zaci. This tour is available from Monday to Saturday. The use of video camera inside the archaeological site has an additional cost. Due to the warm and humid temperature of the region, we recommend to use light and comfortable clothes, hat and sun block lotion. Pick up is available for most hotels located in Cancun and Riviera Maya from Monday to Saturday. Exact time of your pick-up will be sent by email after booking. Tour Xichen transportation is scheduled to depart at 7:00 am and returns approximately at 7:30 pm. The exact pick up details will be confirmed after your reservation depending on the location of your hotel.